Yesterday we planned out the day for today. I was going to get up early, and we were going to go to the train museum. Because trains and little boys equal true love. And little sisters always want to do what big brothers are doing. It was going to be a delightful outing which everyone was excited for. But when oh when does life ever go as planned? I woke up this morning with the headache which haunts me. Instead, I got up very late, made the kids and myself breakfast, begged my mother in law to watch my kids, and I went back to bed. Meanwhile, Keith pulled out his sewing machine. We got him a sewing machine for Christmas because it was super cheap, and anytime I pulled out mine, he tried to push me off it and sew something. He worked hard while I was down for the count. He "sewed" a blanket/foot warmer, and a few other things out of scrap material. It makes me happy to see his creativity flourishing. And Faye follows in his footsteps. The more creative he is, the more creative she is. The kids were great today. Truly and honestly. Two hours after I took some tylenol it finally kicked in long enough for me to function. We went to the store, got treats and supplies for dinner, and then I cooked while they sewed. 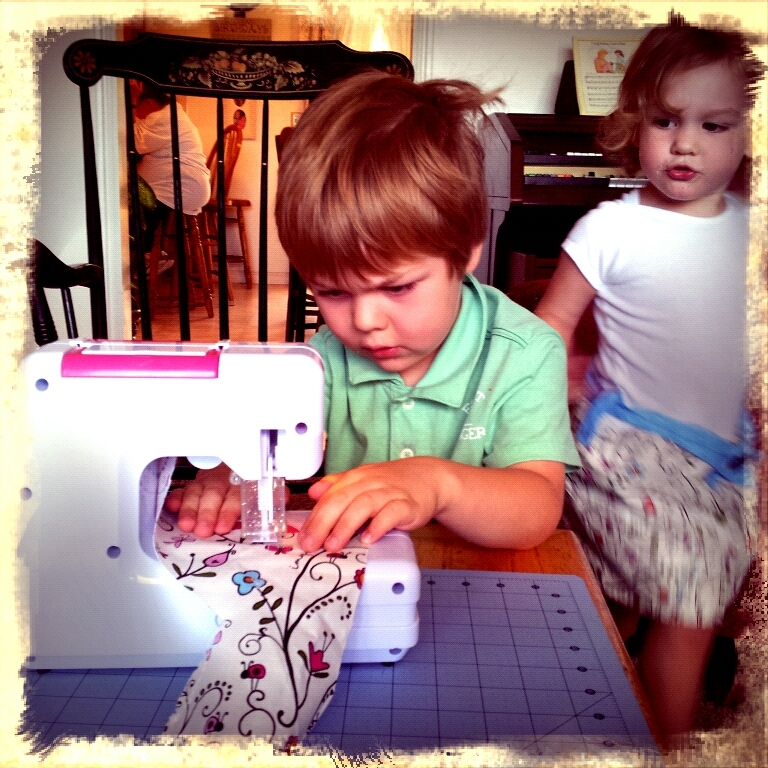 Such a sweet sight to see them sewing together! Talking about creativity, we came up with a chore chart that Keith is very excited for. He wants to help me create it tomorrow, and even more so, to implement it. Genius! It will be modeled after his favorite game, the legend of Zelda. He can earn or lose hearts depending on his behavior, and once all his hearts are gone, there is no chance of earning them back. If he completes the day with 5 hearts or more, he can play The Legend of Zelda with his Daddy. 5 minutes for every heart he has. I am so happy to finally have a system to implement. I have been feeling lost with finding a way to get the kids to have responsibility and accountability. So my plan is to not make any plans for tomorrow, and hopefully it will go as planned. 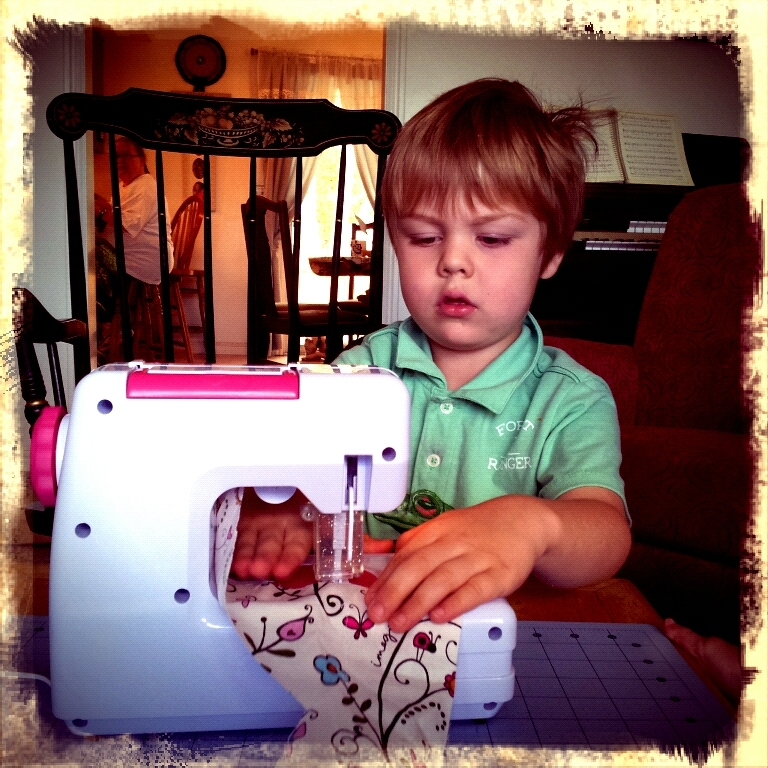 I love that he sews. So adorable. I bet he is a better sewer than I am. Oh and my days never go as planed! It's always good when they are in on the chart and reward system. Hope it works well for BOTH of you. Okay...I am in love with the fact that he sews! Awesome! Now...do you have medication stronger for those headaches??? I hope so. :( So sorry. Please email the Zelda chore chart. I would love to pass it on to a mom of my Primary kid who is Zelda obsessed!!!! Plus I could switch it up and make it lego wii for my son. Plans can be made, but one also has to know that they change. We didn't plan 5 kids, but here we are, staring down number 5 in a matter of days. How cute that he sews!! I don't think I would have even thought of letting my kids sew at that age as I would be afraid of what they may do but he looks like he is doing such a good job.